Boyd of Priceline understands all too well that travelers are driven to shop and compare prices, and that hotel rates change so fast and are so complex that there is always the opportunity to find a deal. And, even when there isn’t, as is the case with airfares in the U.S., there is a strong traveler impulse to shop, says Priceline CEO Jeffery Boyd. Boyd’s line of defense was two-fold: 1) Hotel-pricing is complex and there is plenty of room to find bargains, and 2) Even when there aren’t many price differences, such as is when all the online travel agencies having basically the same airfares, consumers still love to shop so Priceline would not suffer as it provides its own unique user-experience. 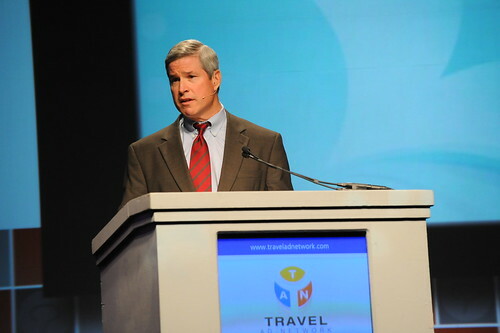 Priceline CEO Jeffrey Boyd at PhoCusWright conference in 2009. Photo by PhoCusWright. Booking.com strongly denies that it is guilty of any kind of rate-fixing effort in the UK, as alleged by the Office of Fair Trading. Booking.com states that with its retail model, hotels have wide discretion to set their own rates. Outside the U.S., such as in Europe, where the chains are not as dominant, the variation in hotel rates is more substantial, Boyd says. He notes that consumers love to shop on three or four different OTA or airline sites even when ITA Software and the global distribution systems disseminate the same airfares. “I wouldn’t assume the notion that prices are all the same will put an end to travel shopping,” Boyd says. Boyd addressed several other issues, including the democratization of travel in Asia-Pacific, and at the airport with smartphones; the company’s unwillingness to follow Expedia’s lead and provide a stock dividend, and its attitude toward Google Hotel Finder. Boyd loves the Priceline Group’s prospects in Asia-Pacific, where its Agoda business is addressing locals traveling within the region and its Booking.com unit, initially at least, is focused on international travelers. “The Asian market is democratizing travel to a great degree,” as travelers with disposable income are moving from the countryside into the cities, and low cost carriers are spurring airline competition, Boyd says. In the past, international travelers might have viewed a trip to Thailand as travel to an “exotic” destination, but now it’s becoming “mainstream,” Boyd says. Boyd didn’t put it in these terms, but he described, in essence, how the mobile revolution is democratizing travel even in the developed world as it puts more power into consumers’ hands. For example, with the Priceline Hotel & Car Negotiator app, travelers can arrive at an airport, reserve a car on the spot without using a credit card, and then walk up to the rental car counter and pick up a vehicle, Boyd says. Boyd indicated that Priceline will be making an extensive marketing push for its Express Deals, where the discounted price is disclosed up-front, and will be bringing Express Deals in a larger way to the company’s mobile apps. Although Boyd began his remarks at the Citi conference noting that Priceline.com is “most well-known for its celebrity pitch man William Shatner,” who championed Name Your Own Price bidding, in recent months, with the advent of mobile, Priceline has found that consumers were less willing to wait around 24 hours to re-submit a bid if their initial one wasn’t accepted. Hence the addition of the Hotwire-like Express Deals to supplement Name Your Own Price bidding. Unlike Expedia, which pays a dividend to stockholders, Priceline’s cash on hand is “not out-sized” and it would prefer to use its cash “strategically” to acquire businesses, Boyd says. If Priceline decides to return money to shareholders, it would likely do so through stock repurchases rather than through a dividend, Boyd says. Boyd expresses no paranoia about Google’s push into the hotel business with Google Hotel Finder, which Priceline participates in. The intent of Google Hotel Finder is to deliver a “more travel-intent customer” to advertisers, such as Priceline, Boyd says, adding that these travelers are more ready to buy than are leads from TripAdvisor, where travelers find themselves much earlier in the research process.